Sturgeon Bay, WI November 14, 2016 – While “looking for a campground” as a young family, Ann and John Bladholm discovered a 40-acre woodland nestled along Claybanks Creek in Southern Door County. There, John and Ann would spend many years vacationing and in retirement, loving the land and exposing their children and countless guests to the wonders of nature. In an effort to preserve their land for their children, to protect its precious natural state and to honor the land’s historic integrity, John and Ann donated a conservation easement to Door County Land Trust. According to Door County Land Trust Land Protection Specialist Drew Reinke, “A conservation easement is a voluntary legal agreement between a landowner and the Door County Land Trust that permanently limits uses of the land in order to protect conservation values.” The Door County Land Trust will now monitor and steward the parcel in perpetuity. 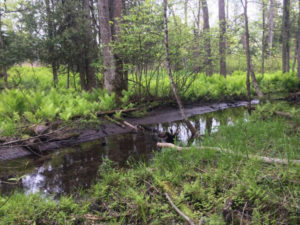 The conservation easement on the Bladholm property protects a mature white cedar swamp, deciduous uplands and 400 yards of Claybanks Creek that is less than ¼ mile from its mouth into Lake Michigan. Migrating birds use the property as stopover habitat and steelhead run the portion of the stream that flows through the Bladholm property each spring. “The Bladholms are habitat heroes,” said Tom Clay, Door County Land Trust Executive Director. “They loved and nurtured their land for more than a half century and now they have protected that same parcel for centuries to come,” Clay said. The Door County Land Trust encourages landowners countywide to consider using conservation easements as a tool to protect their natural areas and farmland from development. Easement donations provide tax incentives while protecting the natural and scenic character of Door County. The Door County Land Trust’s mission is “To protect Door County’s exceptional lands and waters…forever.” It is a nonprofit, community-based organization that actively works to conserve land by undertaking or assisting with direct land transactions-primarily the purchase or acceptance of donations of land or conservation easements. Founded in 1986, the Door County Land Trust has protected more than 7,600 acres from Washington Island through southern Door County and many points in between. Door County Land Trust nature preserves are open year-round to the public at no charge for hiking, cross-country skiing, wildlife observation, hunting, and other low-impact, non-motorized recreational activities. For more information and to become a Land Trust member visit www.doorcountylandtrust.org or call (920)746-1359.